We are happy to share with you the third edition of the Smart Mature Resilience newsletter. This newsletter is circulated quarterly with the latest project results, updates on project activities in cities and the latest news on critical infrastructure protection and city resilience. 1) Starting, 2) Moderate, 3) Advanced, 4) Robust and 5) VerTebrate. A preliminary version of the model is now available, which describes the characteristics of cities on each stage of the scale. The pilot tools testing phase for SMR core city of Glasgow launched on 3rd June at a kick-off workshop, which brought together project partners and representatives of over 30 local stakeholders. Glasgow City Council is focusing on boosting its ability to withstand and overcome flooding, which is predicted to increase in frequency and intensity in the coming years as a result of heavier rainfall and rising sea levels. 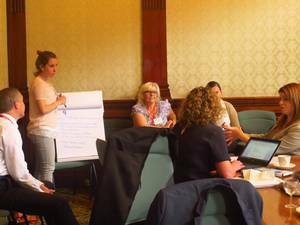 As part of the workshop, the city, project partners and local stakeholders analysed and defined Glasgow’s key resilience challenges and practices in relation to water and the flooding security sector. As part of interactive exercises, the group explored the most effective ways to address flood crisis situations in test scenarios. Early stage pilot testing of the SMR tools has been ongoing since the first launch in February 2016 in Kristiansand (Norway) with a workshop focusing on the water and sewage security sector. This continued in Donostia, where the main focus of the workshop dealt with communication flows in the energy and telecommunication security sector, particularly in emergency situations. The further four project cities (Bristol, Vejle, Rome and Riga) will closely observe the testing process, learn alongside the pilot cities and provide feedback on the project tools via webinars. Four workshops were been conducted in Riga, Bristol, Rome and Vejle to gather cities’ requirements related to resilience. During the first project year, ICLEI European Secretariat, in close cooperation with the three tier-1 cities and their respective research partners organized three ‘Kick-off Workshops’, which gathered the most relevant stakeholders of each tier-1 city, presenting the project goals and outputs, introducing participants to the project’s resilience management approach, and de facto kick-starting the pilot implementation of the tools in the tier-1 cities. The Design Principles have been compiled for a Communication Platform that is currently under development as part of the project. Standardisation partner DIN has shown the current resilience and Smart City standardization landscape with particular reference to security aspects and assessed the standards relevant to the SMR project. The project has also assessed the resilience implementation approaches and elements that can be adapted to relevant critical infrastructures and the role of the population, rescuers and the media with a view to derive a resilience maturity model by means of a Delphi Analysis. Experts from all seven SMR cities met to exchange information and knowledge related to the risks associated to Climate Change and to provide material for the development of the Resilience Management Guideline at the SMR project’s second workshop from 25th to 28th January 2016 in Bristol (UK), which focused on policies, indicators and barriers associated with Climate Change. The third workshop of the SMR project in Rome (Italy) from 22nd to 25th February 2016 focused on policies, indicators and barriers associated to Social Dynamics. SMR has recently been represented at a number of international conferences and events. Spanish and Basque speakers can listen back to radio interviews about the Smart Mature Resilience project with project coordinator José María Sarriegi and Donostia city partner Kepa Korta.